The first six of our Best Jazz Albums of the year, have an international flavor – with recordings from a beloved veteran of the contemporary side of the ledger; an album that is the result of a chance meeting of two world music giants; a free jazz player, who decided to “come inside”; a great saxophonist paying homage to the greatest; an auspicious debut from a rhythm section stalwart and a soulful guitar talent, who deserves much wider recognition. Marcus Miller, producer/composer and above all, bassist extraordinaire made his Blue Note Records debut with this powerful set, which drew inspiration from the music of various locales historically impacted by slavery. But this is not a downer by any means; it is Marcus Miller after all and the music is as funky and varied as anything that the master has dropped in the past decade. With guest turns from, among others, Etienne Charles, Robert Glasper, Lalah Hathaway, Keb Mo and Chuck D (yes, Chuck D! ), the album jumps out at you from the first notes of “Hylife” and doesn’t let go until the last note of “I Can’t Breathe”. It’s got enough groove to keep Miller’s contemporary fans happy, while it is ambitious and varied enough to put a charge into those who need the stimulation. Grammy nominated Cuban pianist Roberto Fonseca and Malian vocalist/guitarist Fatoumata Diawara met by chance at a small Paris recording studio. After talking for a few minutes they were both wowed by how much they discovered that they musically had in common. In 2014, they embarked on a 45 day tour that included among the stops, the Jazz in Marciac Festival, where this explosive recording was made. Incredible musicianship and the unbridled joy of musicians discovering new things about each other with each performance, is what makes this album stand out. I’m hoping that they bring this group to the U.S. Until then, this album and the videos on YouTube, will have to keep me sated. The 2008 Monk Saxophone Competition winner, who is mostly known for his work with the wisecracking avant-garde group Mostly Other People Do The Killing, has undergone a number of emotional upheavals over the past couple of years, including the loss of loved ones and musical mentors. Out of those losses came this album, his most melodic and straight ahead effort in many years. There are hard driving swingers, moving ballads and drum tight section work from Iragbagon’s working group, which includes pianist Luis Perdomo, Yasushi Nakamura on bass and drummer Rudy Royston. There’s also trumpet master Tom Harrell, who guests on three tracks. Though I admit, that Irabagon’s outside work has mostly left me cold, I loved Behind the Sky, when I first heard it and I’m finding new things to enjoy with each listen. Though Rudresh Mahanthappa intended this album to be a tribute to Charlie Parker, there are no Bird tunes among the tracks. They have all been written by Mahanthappa. Instead, the saxophonist gives us Bird’s essence through his own consistently inventive perspective. This is not bebop. It is unflinchingly and proudly 21st century modern. Bird Calls stretches conventional boundaries and even breaks them on occasion. And that is what separates this effort from the often tired category of “tribute albums”. To hear Rudresh Mahanthappa’s Charlie Parker influences, you’re going to have to know something about both artists, and for that alone, this album should be at the top of many lists. Carlos Henriquez has occupied the bass chair in Wynton Marsalis’ Jazz at Lincoln Center Orchestra since 1998, shortly after his high school graduation. The South Bronx native finally takes the spotlight on this album and shows what he has learned over the past 17 years. The Bronx Pyramid deftly mixes jazz traditions with the music of Puerto Rico that Henriquez learned during his youth. This album is danceable, it is listenable and it is above all, captivating. Henriquez is a deft soloist and the woody sound of his bass is never far from the center of your ears. Guest turns from some of Henriquez’s JLCO mates and from the great vocalist Ruben Blades are the icing on this sumptuous cake. 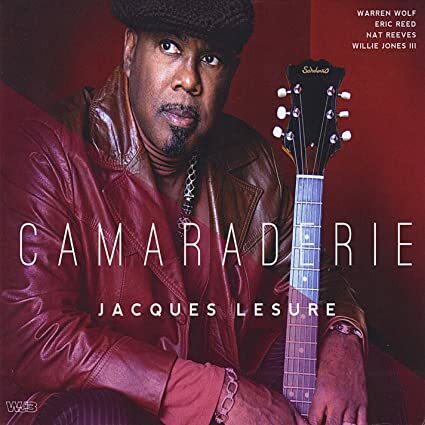 A Detroit native and current resident of the Los Angeles area, Jacques Lesure’s clean, souful lines and straight ahead style have made him a favorite sideman over the years for greats like Jimmy Smith, Stanley Turrentine and Les McCann over his 30-plus year career. He has only recorded a few dates as a leader but each one is first rate. Camaraderie, is no exception. With support from fellow pros Eric Reed, Warren Wolf, Nat Reeves and Willie Jones III, this album swings like crazy. From originals such as the appropriately titled “Grantgomery” to tasty covers like James Williams’ “Affaire d’Amour”, there is not a weak track in the bunch. Excellent jazz! Tracks from all of our Best Jazz Albums of 2015 can be heard on our streaming station, Curt’s Cafe Noir, starting on Sunday, December 27 and continuing through January 2016. Click HERE to listen. This entry was posted on December 24, 2015 at 1:44 pm and is filed under Best Jazz Albums of 2015 with tags Best Jazz of 2015, carlos henriquez, fatoumata diawara, jacques lesure, jazz, Jon Irabagon, marcus miller, roberto fonseca. You can follow any responses to this entry through the RSS 2.0 feed. You can leave a response, or trackback from your own site. Thanks. Will investigate master C!